Professor Pat Bailey, Deputy Vice-Chancellor of London South Bank University (LSBU), opened the School of Business graduation ceremony at the Royal Festival Hall on 17 October 2016. 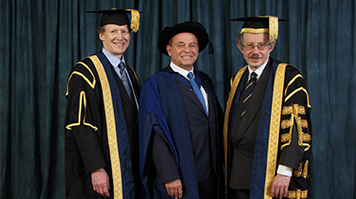 During the ceremony the School awarded two Honorary Fellows: one to Lord James Palumbo of Southwark, a successful entrepreneur and founder of music icon Ministry of Sound who has made notable contributions to local cultural and educational wellbeing; and one to Stephen Perry, who was honoured for his service to business at LSBU and throughout the world. With a career that spans over 40 years and as Chairman of the 48 Group Club, Stephen has been instrumental in opening up trade between China and the western markets and continues to seek creative ways to promote greater understanding between China and the UK. Stephen shared advice with the School's new graduates, encouraging everyone to take the opportunity to learn more about Chinese ways of thinking and working as he believes that China will transform the future of the business world. Stephen also commented on the important role that universities play today in providing students not only with high quality education, but also the support and guidance they need in career progression to help with graduate employment. Business courses at LSBU have been designed to meet the needs of employers and are underpinned by the relevant professional accreditation, working closely with professional bodies, industry groups and alumni to ensure that we focus on the employability skills and attributes that our business graduates need. Find out more about our graduation ceremonies and studying in the School of Business.